Why did Dean Ambrose turn into a babyface once again? The final episode of RAW before Elimination Chamber 2019 was not an easy watch. In fact, I would have to say that even for a wrestling fan like me, this was quite a chore. But there was one interesting segment that I found quite interesting. And I had to write about it. So, Paul Heyman and Seth Rollins had an interesting exchange in the ring. Heyman said that Rollins was not in the same league as Lesnar, while Rollins maintained that he would do anything to stand tall at the end of WrestleMania 35. And the moment the segment concluded, Dean Ambrose's trademark siren hit. Only this time, Dean Ambrose did not get into a flurry of blows with Seth Rollins. He wished Rollins all the best for his match against The Beast Incarnate at WrestleMania 35! 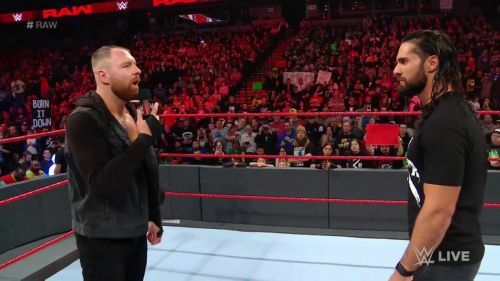 Why did Dean Ambrose turn babyface out of the blue on WWE RAW? EC3's character on TV seems to be very smug and pompous. He says that he is in the 'Top 1%' and that's a very heelish thing to say. He's not even over with the WWE Universe to such an extent that he will be a babyface over Ambrose. In fact, EC3 has not uttered a word since he got called up to the main roster, in his new gimmick. Last week, Ambrose roasted EC3 and the crowd roared in approval at their favorite Lunatic. There was no way that the crowd would root for someone new from NXT over a RAW mainstay for so many years. As a result, I would say that the heel turn actually does make sense from WWE's perspective. It gives both characters more leeway to play to their personal strengths.